All righty, time to roll up my sleeves and get busy blogging about my travel adventures! 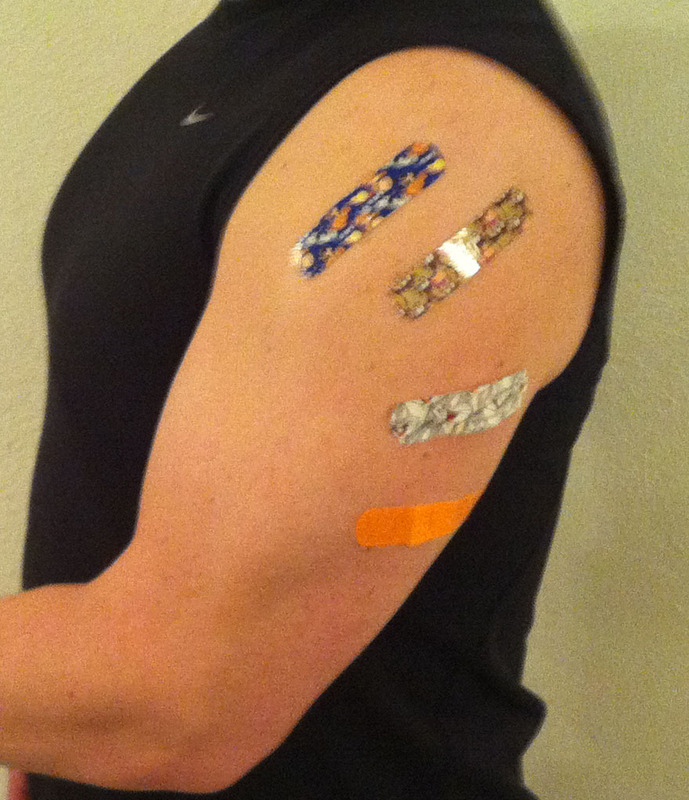 What you see above are pictures of my poor abused arms, fresh from the immunization wars, bravely displaying their medals of honor - Looney Tunes band-aids. Damn, I should have flexed hard for those pictures; oh well, onward. So, about two months ago, I got an offer from within my company to go to Doha, Qatar for a period of 12 months. At the time, it was problematic due to family obligations. About a month ago, I was asked to help a colleague, located in Brazil. She needed advice and guidance on process and methodology, which I was able to provide remotely (i.e., no travel needed). Well, a few weeks ago, both of those turned into viable opportunities as a key family matter was wrapped up and I felt I could leave the country without doing familial harm. For a variety of reasons, ultimately, the winner was Doha, Qatar. Now, it wasn't that simple, of course, there were many entertaining twists and turns, most of which it would not be appropriate to discuss because they are internal to my company and this is a personal blog. What I can tell you is that I did not know where I was going, for certain, until a few days in advance. It certainly made things...more interesting. Hopefully, this is the most obvious thing. You will want to insure your passport is not only current, but be sure that you have plenty of time left on it to cover your travels. In my case, I was told that I needed to have at least six months left to travel. Regardless, you don't want your passport to expire when you are in a foreign country. Another obvious task to resolve, but what shots do you need? Well, the interwebs are your friend here. You can head on over to the Centers for Disease Control's Destinations page to get the information you need. But where do you go for all of these lovely shots, especially the more unusual ones, like Yellow Fever? First, you can check with your company's wellness program / nurse, if they have one; for simple shots, they may have what you need. In my case, they did not so I called my doctor and was referred to Passport Health, a business that specializes in just this thing. In less than 24 hours, I was being briefed on what I needed for Brazil and Qatar, as well as the usual stuff that was simply smart for travel. In total, I received one TB test and NINE vaccinations, four in each arm and one via nasal spray. I was pleased to find out that exercise was not limited; on the contrary they encouraged it. Random comment - because of my time in the army and as a nurse, my vaccinations were a lot more caught up than normal, e.g., I only needed a Hepatitis B booster. Yay! Did my arms hurt? Eh, not really. My shoulders got a bit stiff that night and were a little sore, but nothing incapacitating. Did I get sick? Nope, and I shouldn't have. I was told the Yellow Fever might make me feel a bit cruddy for up to five days, which was less fun to hear with a full day of travel coming up in three days, but for the most part it was not an issue. Vaccinations are not cheap. They gave me close to $1000 in vaccinations and one of my co-workers over here reports that he had around $2000 in vaccinations. This was a nifty idea from the Passport Health folks. Staple your shot record into the back of your passport and then you have the two key documents for immigration bound together. 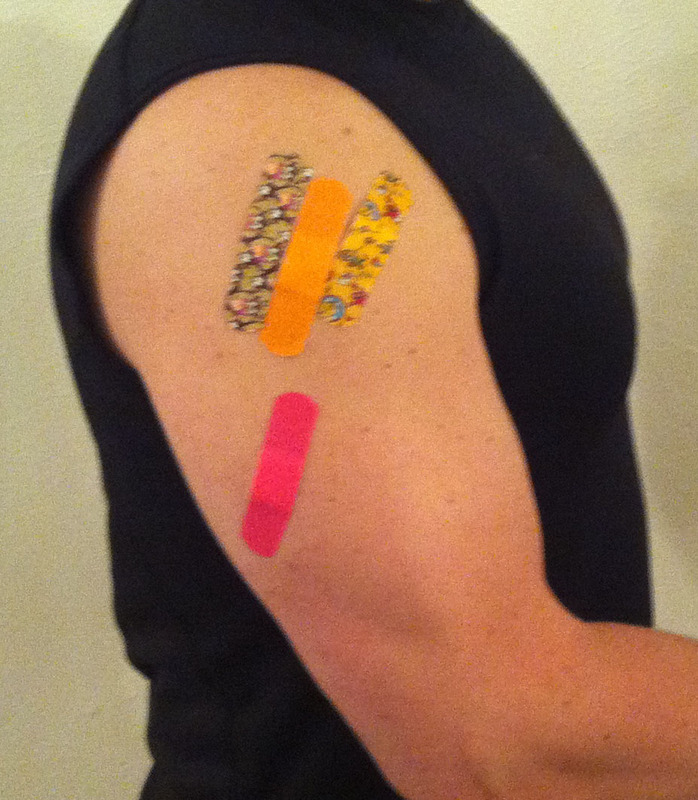 The bonus is that you are a LOT less likely to lose your shot records and have to get extra shots. Fortunately, I don't have any routine medications, so this was not a concern for me. Hooray for healthy living! But, I like you, so I am going to chat a bit about it. If you have regular prescriptions, consider getting a full supply for your trip, just to be safe. Be sure to bring your documentation with you, as you will generally be required to show it (assuming they actually bother to ask/check). Even if you don't have regular medications, you might need to get some. For example, if you plan to visit a country known for Malaria, you should consider getting your prophylactic antibiotics in advance. Pick up the prescription at your travel health visit. Yes, that's right, people all over the world have cooties. Regardless of your gender, there's the whole family planning aspect too. Nothing new here, but you might want to consider picking up your favorite brand before you head out to insure you have a supply. You may find it surprisingly difficult to locate what you want when you get there, and being prepared is far better than hoping you will have enough willpower to interrupt your exotic romantic encounter in a far away land to pick up protection. This was interesting. Figuring out what you need is relatively easy, thanks to the interwebs. I say relatively, because you might get weak or misleading information. For example, my search turned up the adaptelec site which suggested that I needed two different adapters for Qatar. Luckily, my briefing at Passport Health also included the socket type, so I knew which of the two made sense. That said, fair warning, there are multiple three-pronged sockets and the visible differences between, say the Israeli one and the British one are not incredibly stark, especially if you only had a grainy picture in a travel guide as your reference. If you head to your local electronics store, you will see a LOT of choices and, like me, you may find that the store clerks have little to no idea what you should get or 80% of the adapters are for Israel and the ones you need are buried behind them. Also, when you get there, you will find that there are adapters and converters. Adapters simply change your ability to plug into a socket. If you simply throw on an adapter and plug it in, you may fry (literally) your adapter or device. They are cheap. Converters allow voltage conversion between 115 V and 220 V. Frequency can also change 50 Hz vs. 60 Hz, which can be an issue if your device relies on that for timing (the only example I saw was a turntable, so no danger there). Do you need a converter or an adapter? Well, does your device perform at the voltage and frequency where you are going? If so, then an adapter is fine. Laptops are interesting. In recent history, the standard appears to be that laptops generally support everything. For example, here is a picture of my Alienware adapter's specifications. Should you get an adapter? Because they are inexpensive, I picked up a couple to be safe. I wanted to be able to use my computer immediately. If you can wait, then you can play it safe and wait until you arrive, see what you actually need, then go pick it up. Should you get a converter? These are a lot more expensive and, in many cases, still require adapters to use. So, for example, a converter and adapter for a hair dryer can be more expensive than simply buying anther hair dryer where you are going (of course, if you are staying in a hotel, they may provide one). Depending upon how ready you are, for the trip, you may need more or less lead time. I found that the last 2-3 days before my trip vanished in preparatory errands and activities. Do you have a PO Box? Is it paid up past the time you will be gone? Do you need to stop your mail delivery or arrange for someone to pick it up? Large PO boxes give you more latitude in this. Plan accordingly. It occurred to me that an unused car might not require so much insurance. I called my provider, USAA, and was pleased to find out that indeed I could get my rate reduced to 10% of normal while it was collecting dust. There is a downside, if someone were to decide to use it without reactivating, then it would not cover medical, which makes sense. Either way, I saved hundreds of dollars with a single phone call! Yay! Unfortunately, my iPhone is one of the locked variety. This makes it a sleek, expensive paper weight while I am in Qatar. Even though it has the proper technology, the absurd rates from AT&T are unacceptable. Given that it was going to basically be off or in airplane mode while I was gone, I called AT&T and explore my options. It turns out that they have a "suspend" option that dramatically reduces the plan cost to something trivial, like $10 a month. Yay! It's not a bad idea to call your bank and 1) let them know where you are going and what dates you will be there; 2) discuss if there are any limitations with using your debit and credit cards while traveling, and 3) record international customer service numbers that you can use to contact them while away. I had some surprises here. The sheer magnitude of what I was taking caught me by surprise. I expected my gigantic cases to be perhaps 2/3 full...they were stuffed. Shoes: For me, shoes were part of the surprise. I have work out shoes, two pairs of dress shoes, and a few pairs of casual shoes. They ate up a fair bit of space. I feel for someone that needs to take a lot with them. Electronics: This is a personal decision. Whatever you do decide, I recommend putting all of your electronics in your carry on luggage. It may be heavy. It may be awkward at security. But at least they should arrive intact, unbroken and not stolen. Another option, which I learned about later, is to buy the electronics locally and then sell them before you leave; clever, but more complicated than I wanted. For me, this also entailed a complete refresh of my high end business clothes, suits, dress shoes, etc. So, I spent a lot more time shopping in the two weeks leading up to my trip than I had in probably ten years. I tried on so...many...suits. There are easily a dozen more things I haven't mentioned, but the gist of this is that a trip abroad, especially an extended one, can get complicated fast. Think ahead and give yourself a week or two to work out the details. I hope you didn't leave that "paperweight" iPhone at home. I had kind of the opposite problem: bought iPhone while working abroad, was told it would never work back in Canada. It was sadmaking, but I've discovered, whilst traveling in Europe, that the thing is still really useful as a kind of pocket PC as you can find WiFi everywhere! I'm not sure how transferable that is to Qatar, but I thought I'd put it out there. Have a good one, buddy. However, the unlocked variety I bought should work just fine when I get back to the US. Doha Diaries: Days 29-30, NEEDLES! Qatari! Doha Diaries: I Need More Camel! Doha Diaries: Days 10-12, I'm On A Boat!